I remember so well the first time I grew familiar with this place. The spring was flourishing, and the sun was so rewarding after a long and cold winter. It was the perfect time to explore new places, discover new recommendations for travellers, and find ways to incorporate these into our tours. I had heard that Pilsner Urquell, our famous beer in Prague, is exceptionally good at U Pinkasů, a traditional bar and restaurant in the city. After all, this was the first place in Prague to serve what the Czech consider to be the ONLY pilsner type of beer in the world. I walked in through the Renaissance-style entrance and into the old wooden interior with Gothic cellars. My surroundings were as intimidating as the looks cast over to me from local beer experts, who consider U Pinkasů more of an extension of their own living rooms rather than a popular bar. Encouraged by this ‘Czech H2O’ flowing through my veins, I explored U Pinkasů and read about its history. I found the first tap ever used to draft our golden nectar, learned about the ‘Pinkas Nightmare Race,’ discovered a third floor, laughed at some really old pictures of men who were truly dedicated to producing the best beer, and read stories about Jakub Pinkas, who, after tasting Urquell in 1834, was so convinced of its success that he left his job as a tailor to become the landlord of this very pub. U Pinkasů was the first bar in Prague to serve Urquell, and as they say, the rest is history. Now you can find me in the beer garden of U Pinkasů almost every week. Each visit takes me back in time, as I sit sipping my beer next to the tallest Gothic church in Prague, and picture the many historical events that went on in this area of the city — a noble way in which to enjoy your beer! Nowadays, foreigners are also blending in with the locals, as they explore the ‘off the beaten tap’ side of Prague. This makes the atmosphere even more enjoyable, and you can never get bored as you are surrounded by fresh beer, good company, and smiling staff, nearly all of whom speak English. 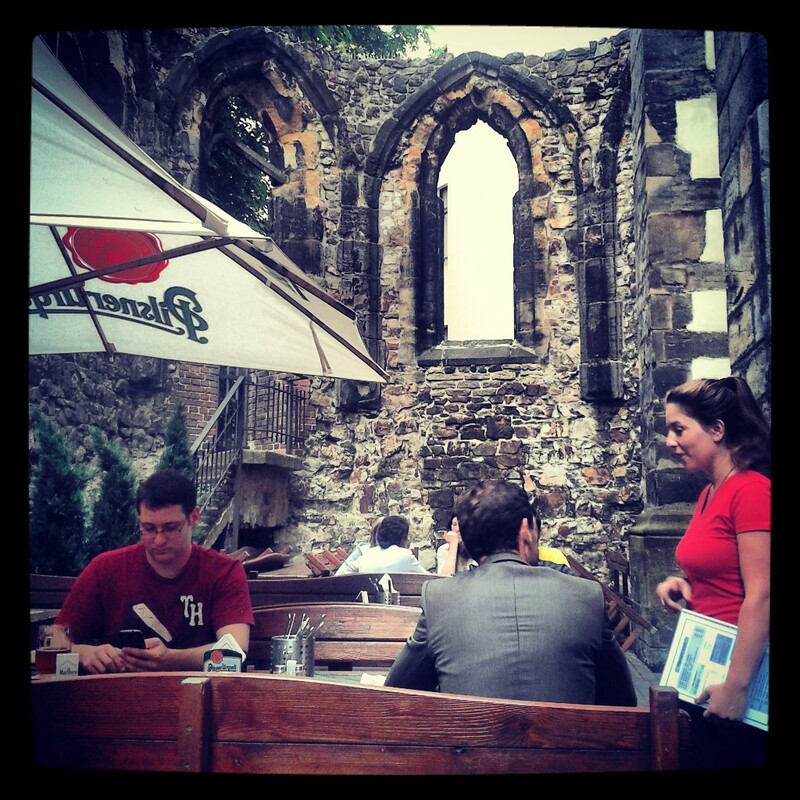 We sometimes call the beer garden of U Pinkasů “The most popular church in Prague.” Why? That’s a secret for later, but don’t be surprised if, after entering through one of the most impressive beer garden entrances in the world, you find a few monks drinking beers. As well as serving one of the freshest pilsners in town (thanks to unpasteurised beer due to the Czech invention of a beer tank), U Pinkasů also serves up some tasty bar snacks. 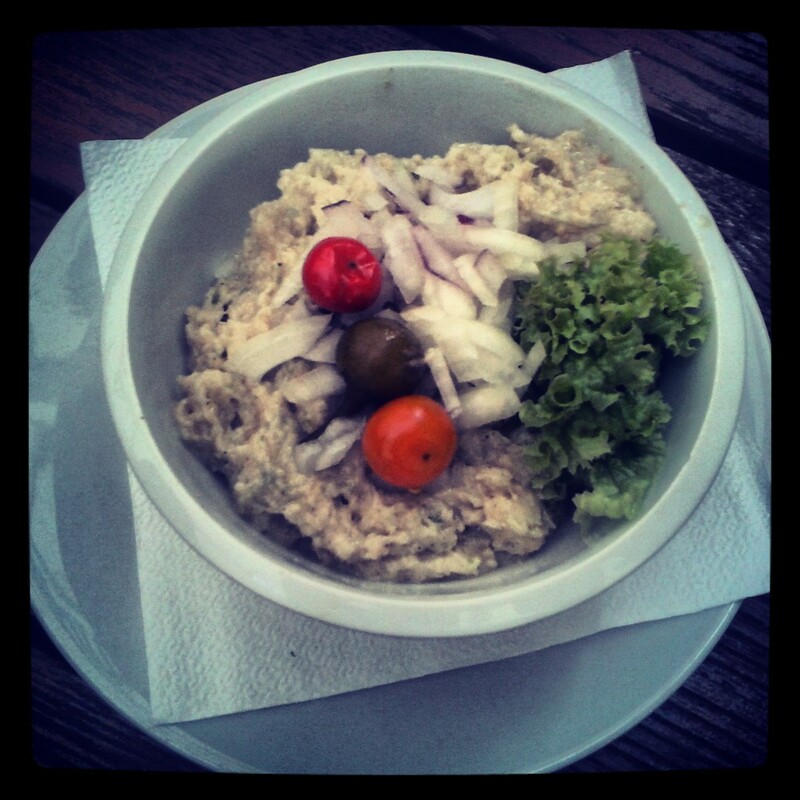 Aside from the aforementioned beer cheese, you can also find other Czech specialties such as homemade lard spread and hot peppers, served with bread, or potato pancakes and gravy for the colder days. (Our favourite dish at the moment is homemade potato pancakes with gravy, finely smoked pork, and slow-cooked white cabbage.) However, there are many Czech delicacies on offer here, so be sure to try plenty of other options — these are just my personal favourites! Beer is a big deal in the Czech Republic, and the average Czech consumes 160 litres of it per year. This makes it one of those unmissable activities to indulge in with locals in Prague, and U Pinkasů is one of the best places to do just that. To quote my wife, “I think for most Czechs, beer is not even considered to be alcohol.” I think that sums it all up quite perfectly.